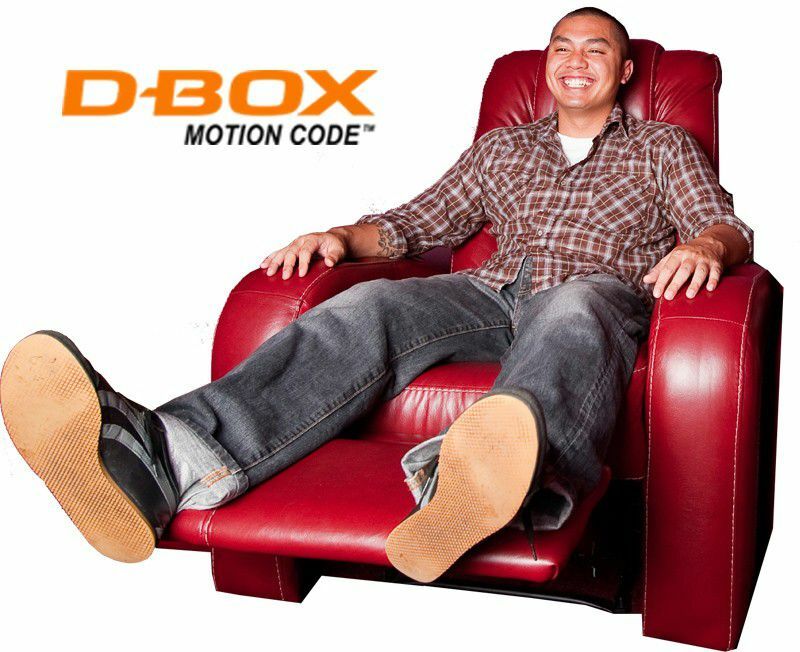 So far, the new D-Box MFX technology is in limited release, and only a handful of movie theaters across the nation utilize the motion seats. I recently experienced the motion at one of these theaters: Emagine Canton of Michigan. At Emagine Canton, the D-Box MFX motion seats account for two rows in just one of the 16 theaters of the megaplex and are centrally located within the stadium seating. At Emagine, you are assigned a specific D-Box seat, and only those seats purchased during a particular showing actually move. The cost of a D-Box seat is above the normal ticket price. If you’ve ever taken a ride in a simulator at a science center or arcade, you know that seat belts are sometimes absolutely necessary. This begs the question, just how much motion should you expect of the D-Box MFX seat? In other words, does the chair's motion make popcorn even more of a choking hazard? The chair's repertoire includes vibration, jerks, and sways. Given the space limitations of traditional movie seating, the motion is much more subtle than a simulator and is used mainly to punctuate the action on screen and/or the musical accompaniment. This means that the purchase of food and drink is still appropriate. While some movies provide more of a D-Box ride than others, most standard theatrical releases have long stretches wherein there is no real action on the screen. This translates in D-Box code as no chair movement. At these times, the chair is more upright and less comfortable than a traditional movie seat. Like camera angles, scene pacing and the music score, the action of the seat (as determined by the D-Box code of the movie print) requires a lot of thought and direction. After all, the action of the chair can be underused, overused or just plain misused. The goal should be to enhance the movie-going experience, not distract from it. The first consideration should be the movie itself. Not all movies are appropriate for enhancement by a motion seat that sways, rocks, jerks and vibrates -- just because the technology is available, doesn’t mean it should always be used. In some ways, The Book of Eli starring Denzel Washington was a good D-Box guinea pig. A moody piece, the swaying motion and X-Box-like rumble of the chair served to punctuate the musical score and helped set the mood of the movie’s first few scenes. The action on screen was also enhanced when the characters bounced along in a truck, experienced a sudden drop or swayed in a boat. Fight scenes were a lot less fun in the D-Box chair, which jerked you right along with the fight choreography. Unfortunately, this sometimes left me empathizing with the nameless thug left sprawled on the ground at scene’s end rather than the Eli of the film’s title. In fact, the appearance of a machine gun left me cringing in anticipation. As expected, the D-Box motion translated into bone-rattling jerks. Given the menu of motion available in a D-Box MFX seat, a horror film, which relies on surprises and sudden bursts of action, would be a great vehicle for the technology. The other types of movies that would benefit from D-Box enhancement are roller-coaster action flicks. One movie that comes immediately to mind is Indiana Jones and the Temple of Doom. The out-of-control mine cart scene would be a lot of fun in a D-Box seat. Swooping along with the flying dragon-like creatures in Avatar would also be an experience –- although how well D-Box syncs with 3D glasses is anybody’s guess. Like the evolution of 3D technology, the D-Box MFX seat will undoubtedly have some hits and misses along the way. For The Book of Eli, the additional cost per ticket was not worth the sometimes distracting experience. As the seats become more widely available, however, the cost will undoubtedly come down and the D-Box experience refined. In the meantime, whatever happened to the scratch ’n sniff cards made popular in the movie Polyester? Most of the regular seats are located behind the D-Box seats in the theater, and the bobbing, vibrating and swirling motion has got to be a little distracting for those folks who didn’t shell out the extra money.